It’s true. Ariana Grande’s hair is so famous, it has a habit of making headlines when she suddenly decides to move its position. It’s slick, glossy, and pin, pin, pin straight. And practically headache-inducingly tight. So imagine our surprise when, just before winning her first Grammy for Best Pop Vocal Album, she went about revealing to her fans on Twitter that she does sometimes let it down for real - and it’s nothing like we thought. Grande shared a photo of her adorable five-year old self with shoulder-length hair and ringlets, telling the world, “This is still exactly what I look like without lashes and my pony," adding, "The only difference is that hand now says bbq grill finger," she said, jokingly referencing her misspelled Kanji tattoo. if i’m honest ..... this is still exactly what i look like without lashes and my pony ..... anyone who knows me knows me knows ..... like .... i’m twenty five. i was five here. the only difference now is that hand now says bbq grill finger. Then a fan decided to respond by asking her what it looks like when it’s not meticulously styled and she only went and did it, sharing a video of her twiddling her hair with her fingers - which is naturally shoulder-length and very, very curly. 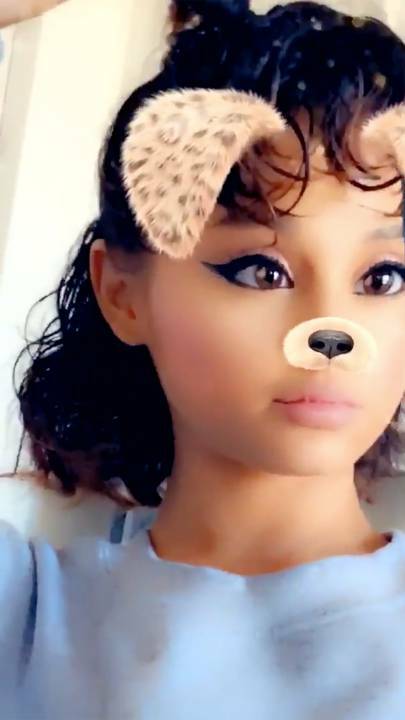 We love that Grande was more than happy to ditch the look for social media and wasn’t afraid to show her followers the real work that goes into creating her signature look, thanks to a hairstylist and heaps of hair extensions.